Château Fourcas Dupré is a Bordeaux winery that produces Cru Bourgeois Supérieur wines in Listrac-Médoc area. 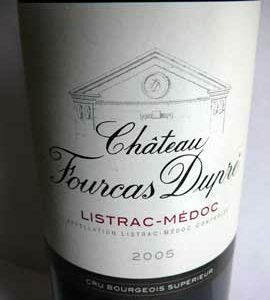 The 2005 vintage of Château Fourcas Dupré is a dark red wine blending Merlot, Cabernet Sauvignon, Cabernet Franc and Petit Verdot grapes. The nose is strong with perfumes of blackcurrant and blackberries, sometimes even jammy, associated with licorice and red flowers in the background. The mouth is still slightly tannic initially, but then providing nice rounded feelings as the wine opens. I found aromas of black fruits with hints of cocoa. 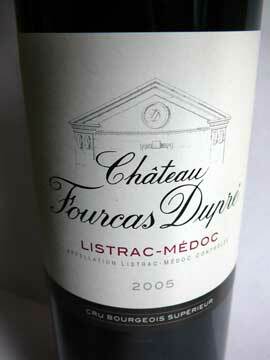 This Château Fourcas Dupré 2005 has a long lasting finish.